It’s a warm summer’s day in London in the latter years of Victoria’s reign, the temperature is climbing and the streets are crowded with the hustle and bustle that we know characterizes the great metropolis. We are in Shoreditch or Seven Dials or any one of the great city’s numerous poorer districts. It is time for an Ice or an Ice-Cream. 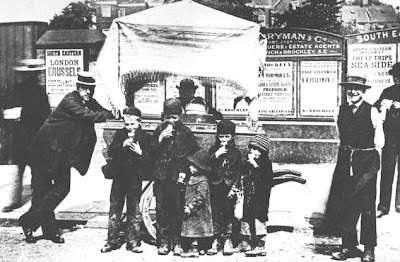 It was only at mid-century that the Ice and Ice-Cream sellers began to make their presence felt, but now in the 1880s, they are everywhere. The Ice-Cream or Hokey-Pokey man, like the ubiquitous organ-grinder, is likely to be Italian and from Saffron Hill in the London Borough of Camden. In the middle of the century Saffron Hill was a squalid slum overrun by paupers and thieves. It was there that the Artful Dodger took Oliver for it was at Saffron Hill that Fagin had his den; a “dirty and more wretched place” than the boy had ever seen. “The street was very narrow and muddy, and the air was impregnated with filthy odours.” Even clergymen visiting the area had to be accompanied by plainclothes policemen. ... little villainous-looking and dirty shops [in which] an enormous business is transacted in the sale of milk for the manufacture of halfpenny ices. This trade commences at about four in the morning. The men in varied and extraordinary déshabille pour into the streets, throng the milk-shops, drag their barrows out, and begin to mix and freeze the ices. Even the frozen water-ices which should have consisted of nothing but water and a bit of flavouring were adulterated. The colouring was artificial, it contained none of the fruit from which it was allegedly made and as Thomson and Smith went on to point out, it was "a very questionable article, and the less consumed the better the consumer will find himself." It was the cream ice, as it was called, that had the greatest appeal. Properly made it included milk and eggs and, therefore, the cost of production, especially when it was made with care and with good ingredients, was higher than the cost of producing Ices, the profits could be considerable. And these profits could be extended by mixing water ices with the cream ices and using milk which was frequently adulterated. All through the Victorian era food was adulterated. It was, put simply, a fact of life. Almost anything you purchased was likely to have had something added. Two reasons for such practices are readily apparent. First, food might be adulterated to make it more appealing. This is a practice which is still employed with the use of food colourings and special lights over meat displays in order to give the meat a richer, redder look. The second reason was to dilute the product in order to increase the profit margin. Adding water to milk is probably the most common instance of this although adulteration was far more widely practiced in terms of the range of foods available to Victorians. Often the two practices merged. James Greenwood, in his 1869 book, The Seven Curses of London, makes a telling point. We are constantly reminded that “competition is the soul of trade,” but we should be loath to think that such were the fact if the term “competition” is to be regarded as synonymous with adulteration, or, in plain language, robbery. The majority of adulterations consist in the addition of substances of greatly inferior nature, for the sake of weight and bulk. Others consist in the addition of various colouring matters, to conceal other adulterations, or to heighten, and, as it is considered, to improve the appearance. Lastly, a few adulterations are for the purpose of imparting smell, pungency, or taste. 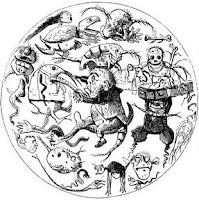 Although a string of acts were passed in the second half of the century, it was not until the 1875 Sale of Food and Drugs Act with its definition of an adulterated product as one which endangered the health of the consumer or one by which the customer was deceived through misrepresentation of the goods, that this process which did so much damage to the health of the British public was gradually brought under control. To read or download a copy of Arthur Hill Hassall's Adulteration Detected (1857), click here. Tuesday, the third of September 1878, was a fine day for an excursion. Around seven-hundred men, women and children took advantage of the weather to cram aboard the saloon steamer, the Princess Alice, for a day on the river. The boat left London about 11.00 in the morning, heading downstream for Gravesend, a distance of thirty-one miles, and from there, on to Sheerness. The trip to Gravesend normally took less than ninety minutes and once there, many of the excursionists went on to one or the other of the tourist attractions, for Gravesend was becoming a popular resort town in the nineteenth century. highly picturesque grounds of about 18 acres, constantly open for a small admission fee, and possessing a rich combination of attractions, variously natural and artificial. Tea gardens, taverns, archery grounds, gipsy tents, abundant lodging houses, salubrious air, cheap living, good bathing appliances, the stir on the river, fine rambling grounds in the neighbourhood, and ready communication by steamer and by railway with London, also draw hither a great and constant concourse of visitors. The town is full of these during all the summer months, and absolutely swarms with them on Sundays. The Princess Alice pulled out of Gravesend and headed back up the Thames at just after 6.00 pm. The passengers, who had paid 2s. for the day trip must have felt that their money was well spent. The weather had been kind although by 7.40 pm, as the boat approached Woolwich, pier to disembark some of the sight-seers, a chill had descended which led the Rev. Gill to go from the front seat of the saloon deck, inside to the saloon cabin where there were about fifteen people. Suddenly there was a crash and William Alexander Law, second steward on board the Princess Alice, said to the stewardess “There’s some barge alongside.” Another crash and Law ran up to the deck where he saw unbelievable carnage. Meanwhile, in the saloon cabin, the Rev. Mr Gill “heard a grazing and grinding of the side of the vessel, then a sudden stop, and then a terrible crash of shivered and splintering timbers.” Running from the cabin to the lower deck on the port side, he saw “the bows of the huge iron-cased ship towering above as high and inaccessible as the walls of a castle.” It was the Bywell Castle, a newly repainted steam collier of 890 tons bound for Newcastle to pick up a cargo of coal for Alexandria, Egypt. William Law, the second steward, ran to a young woman with whom he “was keeping company,” and tried to rescue her, jumping overboard and with her on his shoulders struck out for shore. But as I was going my poor girl slipped off my shoulders, or was dragged off, and I lost her, although I dived for her. I saw a gentleman … who was sinking, and caught hold of him and held him up till we were picked up. Although there were a dozen or more lifebuoys on board and several lifeboats, the accident took place with such speed it would have been impossible to organize their use. Although every effort was made to rescue the survivors, there were very few and many died in the weeks following as a result of the terrible and toxic industrial pollution of the Thames. Of the approximately 700 on board the Princess Alice, the best estimates suggest that 600 died either in the crash or as a result of the collision. Twelve years earlier in almost the same location, a steamer and a collier had collided and while only four lives had been lost in that accident it was probably more good fortune than good management as the excursion steamer, the Metis, ran aground immediately after the collision. Little, if any, change came as a result of the earlier accident, but after the Princess Alice sank with its horrendous loss of life, efforts were made to make the Thames safer both in terms of public health and in terms of safety for navigation. To see a picture of Rosherville Gardens, click here. To see a contemporary drawing of the moment the Bywell Castle hit the Princess Alice, click here. The real "Coster's" entertainment was the Penny Gaff, a form of rough entertainment enjoyed by the lower classes. In reality the Penny Gaff was as far removed from the Music Hall as Albert Chevalier, one of the great Music Hall entertainers and the epitome of the stage "Coster" was from the real thing! At mid-century Penny Gaffs were described by Henry Mayhew. In many of the thoroughfares of London there are shops which have been turned into a kind of temporary theatre (admission one penny), where dancing and singing take place every night. Rude pictures of the performers are arranged outside, to give the front a gaudy and attractive look, and at night-time coloured lamps and transparencies are displayed to draw an audience. These places are called by the costers "Penny Gaffs;" and on a Monday night as many as six performances will take place, each one having its two hundred visitors. ...such an arrangement would reduce the takings exactly fifty per cent. They are all children who support the gaff. Costermonger boys and girls, from eight or nine to fourteen years old, and errand boys and girls employed at factories. On a Sunday I goes out selling, and all I yarns I keeps. As for going to church, why, I can‘t afford it,--besides, to tell the truth, I don‘t like it well enough. Plays, too, ain‘t in my line much; I‘d sooner go to a dance--its more livelier. The ‘penny gaffs’ is rather more in my style; the songs are out and out, and makes our gals laugh. The smuttier the better, I thinks; bless you! the gals likes it as much as we do. When one entered the performance area, there was usually a pit which held approximately fifty people and there might be some wooden benches arranged to form a primitive gallery to hold the overflow. In 1853, Max Schlesinger commented on the practice of men sitting on one side and women on the other and suggested it was because the men "chiefly labourers and apprentices, luxuriate during the representation in the aroma of their “pickwicks,” a weed of which we can assure the reader that it is not to be found in the Havanna." ...be roused to increased vigilance in the suppression, as well as the arrest of criminality, it would be as well if those in authority directed their especial attention to these penny theatres. As they at present exist, they are nothing better than hot-beds of vice in its vilest forms. “Music hall” refers to both a popular form of miscellaneous entertainment and the institution that housed and promoted it. The Music Halls fulfilled much of the entertainment needs of the urban population, and particularly the needs of the lower and labouring classes. It was, at least marginally, a safer environment than the Penny Gaffs so beloved of the coster lads and lasses. In the middle years of the century, although still a place for drinking as well as being entertained, Music Halls were becoming establishments in their own right with purpose-built premises. Nonetheless, their clientele, at mid-century, remained largely single young males and some young women. By the 1870s some of the Music Halls, particularly those in the West End were moving away from their traditional working-class origins. Improved public transportation meant that those in the upper working and lower middle classes, now living in the suburbs of the great metropolis, could come into the West End for a night’s entertainment. Suddenly Music Hall had become family entertainment. undesirable to visit many of these establishments on the same evening, as it is quite possible to go to four or five halls in different parts of the town, and to find widely diverse stages occupied by the same sets of performers. In the 1870s and ‘80s, if one attended performances at any of the brilliant Music Halls in London, the shows would have been very much the same, differing only in their greater magnitude from those seen in other cities and towns and in the appearance of more illustrious performers. The “bill” would usually include a variety of items including gymnastics, ballet and the always-popular comic singing. In fact, when one thinks about Music Hall, it is this latter “turn” that tends to characterize it for us. We forget the performing animals, sporting celebrities, strong-men, magicians, ventriloquists, and all the other forms of entertainment too numerous to mention. They don't pay their sixpences and shillings at a music hall to hear the Salvation Army. If I was to try to sing highly moral songs, they would fire ginger beer bottles and beer mugs at me. I can't help it if people want to turn and twist my meanings. when delivered with the fine sense of innuendo that this marvelous entertainer was capable of mustering. Growing out of the Penny Gaffs and originally an entertainment for the masses, Music Hall soon became the dominant form of amusement in the second half of the nineteenth century. Many contemporary entertainers owe a debt to the great entertainers it produced; carrying on the tradition whether in films, television or on the stage. Surely the goons, Frankie Howard and Charlie Chaplin all owed a debt to Music Hall as, in an even more direct sense did performers of the first half of the twentieth century like Gracie Fields and Stanley Holloway. Among the many great performers of the Music Halls was Little Tich. I'll say more about him in a later blog, but to see a performance of his famous shoe dance, recorded around 1900, click here. Noise, noise, noise. It didn’t matter which way one turned, Victorian London was awash with noise. Noisy traffic, noisy industry, street musicians, the cries of street-sellers and street collectors echoed through London. From morning till night, the costermongers could be heard crying their wares and music whether just the organ-grinder, or the full brass band seemed to surround one night and day. 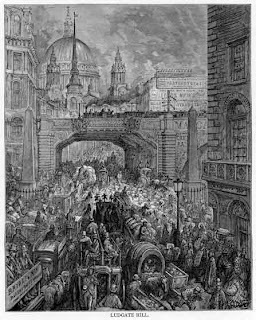 Traffic in London was extreme as much of the city was created long before Victoria came to the throne. Streets were narrow and paved with cobblestones. The wheels of the transport were iron-shod since the pneumatic tyre did not come into use until the 1890s. In the streets horses and pedestrians mingled. A doctor, writing to The Times from Harley Street on 13 August 1869, complained amongst other things, of the way in which Cab drivers would hold long conversations from opposite sides of the road at the top of their voices and scavengers would shout jokes from cart to cart. The letter went on to complain of paper boys yelling out the news, musicians disturbing whole neighbourhoods, and drunks “who choose to sing and holloa up and down our streets and squares.” Then there were “the early organ-grinders, collectors of hares’ and rabbits’ skins, sellers of watercresses, [and] the inevitable dustman” to keep one from sleep. Street Organs seem to have been the bane of the Victorians’ existence. In part this was because of the noise they created; by the 1860s there were estimated to be over one-thousand organ-grinders in London alone. But there may be more to it than just noise. From the constant harping upon the ethnic characteristics of the Organ-Grinders, one gains the impression that much of the objection was xenophobic. Small children danced on the pavement “to the mingled accompaniments of jig music, obscene songs, and profane oaths.” While this went on in the streets one could also hear the sounds coming from the public house; “the confused noise of many voices brutalised by drink, and all trying to make themselves heard at the same time.”On Monday, Wednesday and Friday the noise from horses and wagons from the Covent Garden Market often woke one through the night and, of course, on Saturday and Sunday night "it is almost impossible to get any sleep before three or four o'clock. For some hours after the public-houses are closed there is a continuous uproar-singing, shouting, howling, yelling, cursing, fighting; women's voices crying "Murder!" and the voices of little children screaming with terror, while their parents are engaged in a desperate fight with their boon companions, or with each other." 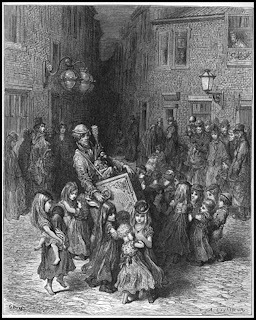 Henry Mayhew, who chronicled lower-class life in London in his great study, London Labour and the London Poor, has much to say of the noisy street life of the Victorian metropolis in the 1850s. He describes life in the streets whether it is the Punch professor (as they were known) or the poorest watercress seller. Often street exhibitors had assistants with a drum or some other instrument to attract the crowds. An exhibitor of mechanical figures told Mayhew that he had “two men beside myself, one plays the organ.” But whether with organ, drum or some other instrument, street performers, thimble-riggers, costermongers and anyone with something to say, show or sell hollered and shouted, banged and whistled to draw a crowd. With so many street performers and beggars, the noise must often have been intolerable. Then, there were the bands and musicians; the violinist who imitated barnyard animal, the bell ringers, cellists, street bands (according to one of Mayhew’s informants there were around 250 street bands, not including black minstrel bands). There were English bands, German bands an, bagpipers. There were hurdy-gurdy players and harpists and clarinet players. Assisting the organ-grinder one might see a trained monkey or dancing dogs and one could go on almost indefinitely. If it was an instrument that could be played, it was likely to be found on the streets of Victorian London. If it wasn’t instruments, it was often the sounds of the street vocalists; Black serenaders, glee-singers and balladeers. If a street performer couldn’t sing, he or she might whistle. The street seemed to draw the most bizarre forms of “entertainment.” One found the blind reader or the writer without hands or the blind profile cutter working in London and selling their products with shouts into the infernal din. Add to all this, the sound of carts on cobble-stones, the neighing of horses, the sound of steam trains and all the ordinary cacophony of the streets and London was noisy indeed! One thing that commentators, both domestic and foreign, noticed in Victorian London was the smell. To put it in the simplest possible terms, London was "on the nose." As the city expanded and industrialized, tenements spring up to meet the housing requirements of the factory workers and their families. Older buildings were turned into flats which were then subdivided into even smaller flats. Rents were high, often requiring several families to share accommodation even forcing large families into one room. Landlords cared little about the conditions of their tenants knowing that they could always fill vacancies and, in the process, raise the rent still higher. The conditions under which the poor lived were appalling. Bathing facilities were minimal and often a family's only access to water was through a communal pump which might only operate for several hours in the day. Of course, as the population of London increased, suburbs became increasingly distant from the heart of the city. In order to move from one part of London to another, one could walk, go by train or rely, in some form, on horse power. Coal burning trains and a coal fired economy filled the air with soot. Horse power, too, created by-products, the primary one of which was manure. Tons of this muck dropped into the streets daily. One estimate has it at 100 tons daily. So much manure, often decomposing, meant that its smell pervaded London. Most streets had crossing sweepers who, for a small gratuity, would precede a person wishing to cross a street, sweeping the muck aside in order to make a relatively clear crossing. London stank of unwashed bodies, raw sewage, coal fires and horse manure. And most of all, it stank of the Thames, for the Thames was, particularly in the early years of Victoria’s reign, the great sewer of London. The problem reached its apex in 1858, the year of the Great Stink. The smell off the river was so intense that members of Parliament avoided sessions and wandered around the building with handkerchiefs held over their noses. In an attempt to ameliorate the stench, curtains impregnated with chemicals were hung over the windows. A number of factors combined to make what was normally unpleasant, appalling. In part the problem was exacerbated by a very warm summer. The increased population meant an increase in human waste to be disposed of. While the flush toilet or water closet was a great step forward in public hygiene, they discharged into the old cesspits which were meant only to collect rainwater and discharge it into ditches and streams that eventually found their way to the Thames. Increasingly it was human waste that was finding its way into the Thames along with the byproducts of those industries which, needing water, lined areas of the river and discharged their noxious wastes into the water. a stinking vapour, which is in the highest degree offensive, and which inhaled produces slight headache, giddiness, and nausea. The water at midstream is charged with the higher forms of animal and vegetable infusorial life, but at the shore is so lethal in its qualities that nothing exists in it but the lowest forms of fungi and the simplest of living creatures. Those travelling on the river often remarked on its smell. George Godwin went to Lambeth via one of the many boats plying the great waterway, a “Thames omnibus.” He eventually alighted “to escape the fearful odour which was floating over the water from the mouths of the sewers opened by the retiring tide.” Godwin went on to describe an area around Lincoln-inn-fields with six slaughter-houses, a large tripe-boiler “the effluvium from which is very bad,” and stables. In one house water was coming in. There is one cask capable of holding about fifty gallons, another a little more. There is no tap in these casks, so each person is obliged to dip vessels, however dirty, into the water. This supply is for three small houses, containing five families of from five to six persons each: this number the people allow, but some of them being Irish, it is probable that they have lodgers. The people do not like to drink the water from the casks. This dwelling-place has two slaughter-houses at the back, a closet close to the water, a dust-heap, and an open gully-hole in front. The smell of this place is shocking. We went at random into a house in Sheppard-street, close by. The drain is stopped: the smell, even before passing the threshold, is frightful. … So bad was this place, that we were glad to rush out into the somewhat purer air. And while Godwin was able to remove himself from the stink of London, all too many of its residents were not able to do so, living with it continuously. For more information on London and the effect of its air and water, click here to read Stephen Halliday's 2001 article in the British Medical Journal, Death and Miasma in Victorian London: An Obstinate Belief. When they entered the Tunnel, and were told that they were under the middle of the Thames, and that the great ships were riding over their heads, they stood in utter astonishment, with their hands over their mouths (denoting silence), and said nothing until they came out. They called it the “Great Medicine Cave,” and gave the medicine (or wa-be-no) dance at the entrance of it. Started in February of 1825, the world's first underwater tunnel was opened to pedestrian traffic on 25 March 1843, and is still in use today. The “Great Bore” as it was affectionately known was originally designed to provide for carriages to be driven through its length and to house a walkway for pedestrians, including shops and exhibitions. During its construction, such was the interest in the project, that for a fee it was possible to arrange to be lowered down to watch the work in progress. Today, passengers on the East London Line of the Underground would probably be surprised to know that as they rush to and from work and home, travelling under the Thames from Rotherhithe to Wapping, they are using that very same tunnel designed by Sir Marc Brunel and built, in large part, by his son, Isambard Kingdom Brunel. During its construction and immediately after its completion, the tunnel was one of the wonders that everyone seemed to want to see. It was opened for pedestrians in March, 1843 and two months later the Queen, accompanied by Prince Albert and a party of notables visited the Tunnel. The party arrived by Royal Barge and the Queen descended into the Rotherhithe Shaft. Her Majesty was presented with a gold medal with a view of the Tunnel on one side, and Brunel's head on the other; a memento of her visit. Later it was visited by Sarah Rogers Haight, a traveller from New York who described it in glowing prose. Only to think of all these marvels! My mind aches with thinking, as does my head and eyes with seeing; and what an accumulation of wonders of the world might we now have if the days of wonders as well as miracles had not ceased. The Tunnel itself is a wonderful creation; standing in the centre, and looking each way, you get a fine idea of its extent, you see about a quarter of a mile each way, and the perspective is very good; the arches are small at the bottom and larger at the top—a division running between the two archways forms a footpath, and a place for the stands of the venders of different articles. In the Tunnel, arches and Doric columns, pilasters and porticos lined an arcade with stalls and shops. On her visit to the Tunnel, Sarah purchased a candlestick and a medal similar to the gold one struck for the Queen. During the first three or four months of its opening, the tunnel had over one million paying visitors and from the beginning of construction until 1865, twenty-four million paid to either visit or pass through the Tunnel. .Sadly, however, like many such attractions, its appeal soon faded after its completion, possibly in part, because of its less than salubrious location. Open 24 hours a day, all year round, its primary clientele was workers who found it a useful passage from one side of the river to the other, a convenience for which they were charged one penny. By 1846, the directors were being informed that the numbers passing through the tunnel, and therefore its income had declined for the second year running. In fact, in 1844 the Tunnel’s revenue was £6137 declining four years later to £3796. It is difficult to know just how dangerous the Tunnel was to pedestrians. Certainly, a robbery was reported in May of 1845, in which, around midnight on the 18th of that month, three men attacked a pedestrian, dragged him down the Rotherhithe staircase and robbed him of 5s. 8d. and his house key before kicking him in the forehead and leaving him unconscious. The same report, from The Times of 23 May 1845, complained “that after a certain hour of the night the tunnel is infested with loose women”. From a financial point of view, the Tunnel was never a success. One writer to The Times in January of 1863 referred to that “desolate Thames Tunnel” as “that Gulf of Capital and by-word of profitlessness. The Tunnel was finally closed to pedestrian traffic on 20 July 1869, having been sold, in 1865, to the East London Railway Company for little more than one-third of the £600,000 expended in its construction. To see what the Tunnel looked like in 1843 when opened for pedestrian traffic, click here.